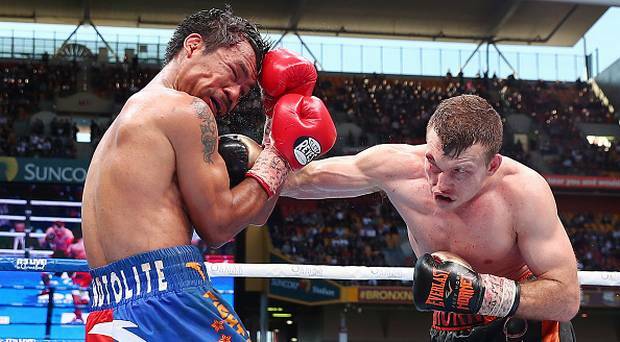 WBO welterweight champion Jeff “The Hornet” Horn 18-0-1 (12) has suffered a cut in his final sparring session 11 days out from his scheduled WBO welterweight title defence against Terence “Bud” Crawford 32-0 (23) at the MGM Grand in Las Vegas, Nevada on June 9. The scare came in his last sparring session against Philly southpaw Ray Robinson 24-3 (12) who was drafted into camp to provide Horn with 40 rounds of hard and fast sparring during the last two weeks of his preparation for the biggest fight of his career. Midway through the 10 round sparring session Robinson stopped punching and pointed out the blood near the champion’s left eye. Sparring stopped while trainer Glenn Rushton examined the wound. The cut comes less than a week after Horn was involved in a three-car accident after leaving strength and conditioning coach Dundee Kim’s Brisbane gym. Horn was quickly back into the fray, finishing off his sparring session with Robinson before putting in a further two rounds with Tokyo Olympic hopeful Andrew Hunt. “I’ve trained very hard for this fight and I’m in the best shape of my life. Better than I was even when I beat Manny Pacquiao. Ray Robinson has given me great sparring,” said the 30-year-old Horn. Coach Rushton agreed with those sentiments. “I’m thrilled with Jeff’s preparation. He’s 20 per cent better than when he beat Manny Pacquiao last year. His workrate and intensity are right where I want them,” said Rushton. Horn flew out to the USA on Wednesday where he will be making a career-high payday of $2.5 million for his mandatory title defence. The “Fighting Schoolteacher” knows he is an underdog going in to the fight but says he won’t be thrown off by some of the tactics being used by Crawford’s camp. “They’re trying to make me feel nervous and to doubt myself, but I haven’t done that for a second,” Horn told Fox Sports. “I’m not scared of this guy. You have to be confident in boxing. If you go in there thinking you’re going to lose then that’s exactly what will happen.